“There is no question that Argentina is going to enter into a severe recession in the next year,” is the ominous assertion of economist Brad Setser, in an interview with Altamar to discuss the financial crisis facing Argentina and its President Mauricio Macri. Such predictions are light years away from the hope and enthusiasm that welcomed center-right Macri when his election in 2015 effectively ended twelve years of rule by the controversial populist Peronist couple, Néstor and Cristina Kirchner. The international business community was relieved and excited, and Macri quickly appeared on top 100 lists as one of the most prominent leaders in Latin America. Investors flocked to Argentina, hailing its new free market reforms, and optimism was in the air. Yet just a few years later, Macri went from posing on magazine covers to negotiating a very unpopular $57 billion bailout package with the International Monetary Fund, the largest loan in IMF history. To understand what went wrong for Macri and what’s in store for Argentina’s economic and political future, we bring in Brad Setser, Senior Fellow for International Economics at the Council on Foreign Relations. Setser previously held positions at the National Economics Council and the US Department of Treasury, where he worked on Europe’s financial crisis and Puerto Rico’s debt crisis. He is the author of the celebrated economics blog, Follow the Money. “You don’t want to start from the position Macri started,” Setser points out. Years of irresponsible spending and centralized economics under the Kirchners left Macri to inherit a fragile economy with high inflation and a depreciating currency. When he came to power, he put Argentina back into the international economic system, but the fixes didn’t stick. A bad drought and rising U.S. interest rates that drove investors away from emerging markets made matters worse. The Argentine peso soon became the worst performing currency against the dollar. Setser explains why the warning signs of the economic turbulence in Argentina were clear. “Essentially Macri was betting on continuous access to the international bond market and that didn’t pan out,” he says. 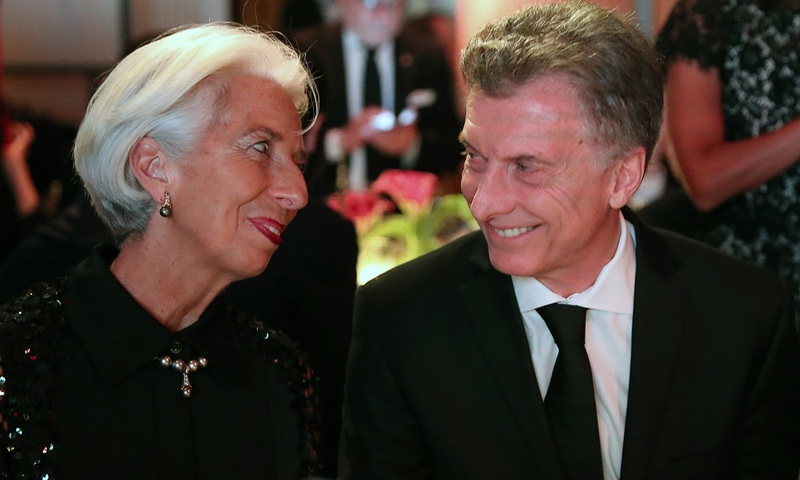 The new IMF package will “put the brakes on Argentina’s economy,” says Setser. “I’m looking for a quite sharp recession next year, a fall of several percentage points – much larger, sharper, more devastating, and more painful than the recession in 2016,” he predicts. Now facing a future tied to a draconian IMF rescue package, the ghosts of 2001 could come back to haunt Macri. Once esteemed as the only non-Peronist president to finish his term, the question now is will he make it to 2020 and beyond? An optimistic scenario is that the recession eliminates Argentina’s external borrowing and a good harvest allows the country to effectively recover on the back of exports. But an all too possible scenario is that the recession drives down tax collections and forces Argentina to cut expenditures, in effect accelerating the downturn and inhibiting recovery. “After the new election, in 2020, Argentina could be left in a position where its finances aren’t stable, and it cannot raise money to roll over its debts. It would either need to restructure or get more financing from the international community,” Setser says. The repercussions from such a scenario could also trigger a global spillover. “There is some risk that if Argentina doesn’t put itself in a position where it can avoid a new default, then that would have a global impact,” Setser says. Listen now to Altamar’s analysis of Argentina’s spiraling economic crisis and Macri’s political future – available for download.